In the pages of our magazine I have brought you reports from my last cactus trip of two quite extreme habitats in Chile. The Quebrada San Ramon at near sea level and the Tatio Geysers at 4000m had features in common that they were both very rocky and very arid. Our trip started at Córdoba in Argentina and here was a countryside packed with cacti and very different from my concept of ‘cactus country’ based on the deserts of the US and Mexico I had seen. Flying into Argentina from Chile we crossed the huge mountain chain of the Andes and we looked closely at the landscape on our approach to Córdoba. Several vast salt flats were different but our landing might well have been at Luton; neat tree lined streets, motorways, shopping malls, golf courses and especially the countryside was green, woods, scrub and grass. Alicante in Spain looks from the air far more like a desert than my first experience of Argentina.On the ground it was the same; lush grass and scrub seemed to cover all the wild places with deciduous trees scattered, or in woods in the valleys. On our first trip to see cacti we found that though it was very green, it was very prickly. 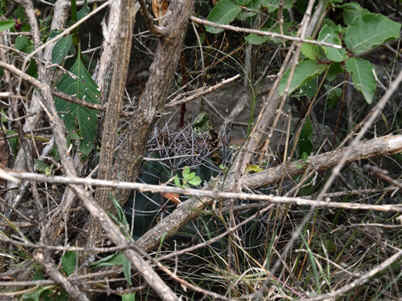 At the first habitat, TW001.13 on a road cutting, the rocks were overgrown with Acacia, cacti and spiky bromeliads. The spines I picked up there in my hands and legs festered for the next week to remind me to be very careful in my enthusiasm to see new cacti. 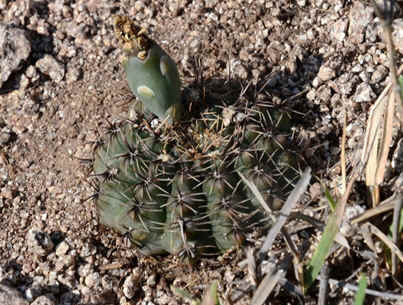 Though relatively large, Gymnocalycium monvillei and G. mostii were at many of the first places we explored, often they were difficult to see in the grass or at the base of prickly shrubs. We were told that this was the end of the rainy season, (yes, we did get some showers), and there were rivers in spate and tracts of flooded land. Apparently the cacti are more obvious as the heat of summer builds and the grass dies back. For comparison annual rainfall in the Córdoba mountains is recorded as 850 mm/year compared with 580mm locally in Northants. 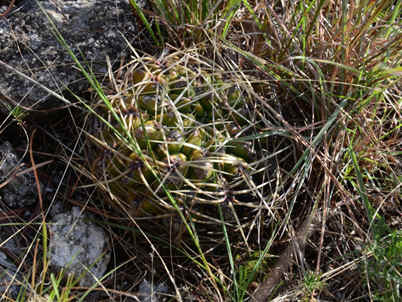 Left: Gymnocalycium mostii hiding in the dense shade at the base of a shrub. Right: Gymnocalycium monvillei lurks in the long wet grass. At nearly 2000m, the highest point we visited in Córdoba Province, was a strange landscape with short, grazed grass which would grace a golf course. 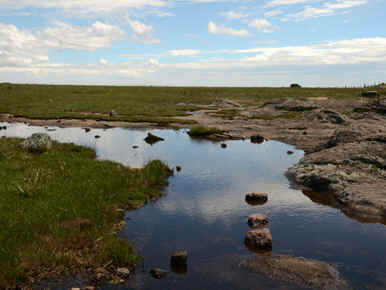 There were low flat rocky places and many shallow depressions filled with standing water. Here we found large G. monvillei again and small G. andreae. This last is a small growing species that clusters prolifically but the thousands of plants we saw growing in wet moss at the water’s edge looked more like seedlings; difficult to tell. At the same habitat spiky Eryngium agavifolium grew and you can buy this in a garden centre near you for your garden. Rather frightening were the local lapwings which dive-bombed us to protect their nests in the turf. They were very fast and very close; scary! Right: The habitat of G. andreae at nearly 2000m. Large plants of G. monvillei also grow here. 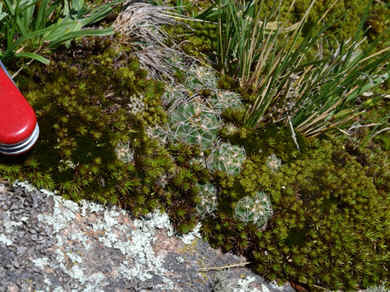 Far right: Gymnocalycium andreae growing in sopping wet moss. 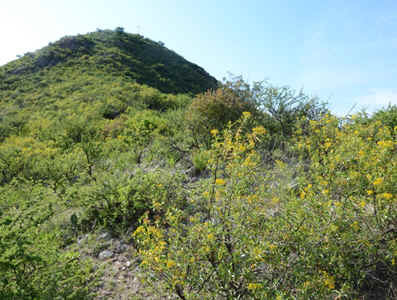 TW024.13 was a habitat for Gymnocalycium erinaceum on a very steep slope. We had to find our way over the barbed wire, through the brambles (yes, real English blackberries!) and between the Acacia to find just a few plants hidden in the long grass. A slip would send us tumbling down the hill; I am not sure whether a broken bone would be preferable to being skinned alive by the spikies. Knowing my luck it might be both! Not far from here I lost the sleeve of my shirt to an Acacia. It saved some suitcase space on the trip home. Far left: A hill, green with deciduous shrubs in Córdoba province, home to Gymnocalycium erinaceum. Left: Gymnocalycium erinaceum at that habitat. I enjoyed my week in Córdoba Province looking for the cacti, and of course seeing the sights and meeting the people. The countryside was very ‘English’ and was packed with different Gymnocalyciums. (At least they were claimed to be different,) There were also prolific Echinopsis (Lobivia) aurea and Parodia mammulosa. (Back in the 70s, when this was called Notocactus (sub)mammulosus, it was the most common cactus raised from seed. It was self-fertile and often self-set seedlings popped up in the pot. It seems to do just as well in habitat.) However I was quite pleased to head north and west to see what I would term ‘real’ desert cacti growing in a real rocky desert. A week later we were looking at Copiapoa but it turned out these were just as difficult to identify as the Gymnos. I hope I will be able to return to Argentina. And certainly since I have seen these plants growing in these habitats I will be giving them a more generous watering regime in my greenhouse.